The script is available for download HERE.. Though I just got word of this tool and didn’t get a chance to play with it in the office, I’m curious as to why would an innocent user’s computer choose to use my ip address instead of the real printer’s ip address to send print jobs to. Getting people to print to your IP isn’t really the goal. 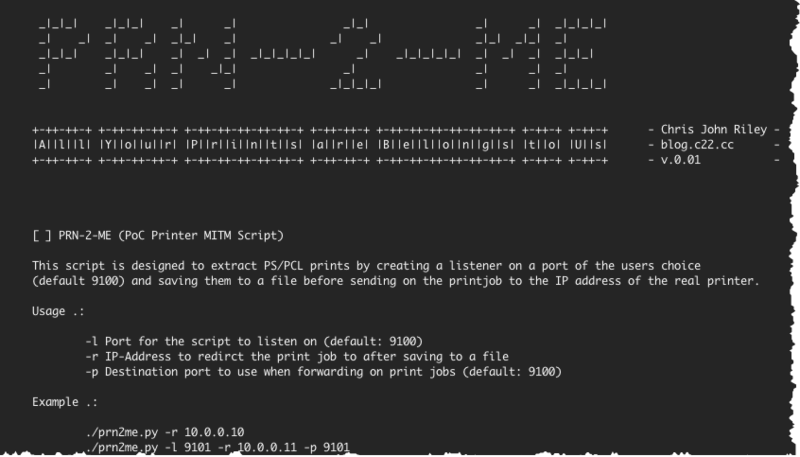 A couple of examples (other than physical access to the printer or client), ARP spoofing, DNS spoofing (if printing to a DNS name and not direct to an IP address)… anything where you can perform a MITM attack on a client you can apply to perform a MITM on printjobs as well. I didn’t read it thoroughly and for some reason I thought that the tool would actually broadcast itself somehow and trick clients into believing it’s “the real printer” without having to MITM. If using MITM can’t you do the same thing by dumping the files via any packet capturing software (note: I’m not trying to say that having a tool that automatically dumps the print jobs to PS files isn’t cool. Just trying to get a clearer image) ?